The left picture was made without a blue daylight filter, the right one with the filter placed over the lamp. The filter reduces the red parts of the spectrum. Lamps with a tungsten filament (this includes halogen lamps) have a tendency to change their color temperature depending on the light intensity. LED lamps do not show this light intensity related color shift. When the lamp intensity is low, then the color of the lamp is more red, at high intensity settings the color becomes more blue. 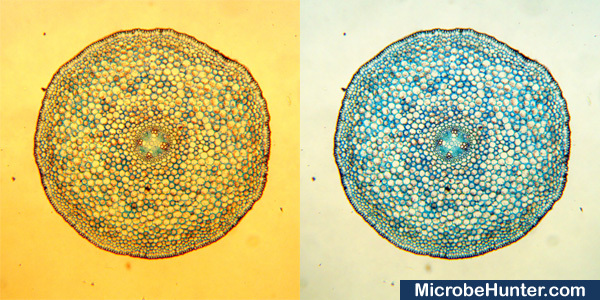 This can result in a significant color shift, which is not so relevant when doing only visual work, but can be a bit annoying when making micrographs. The pictures have a yellow-orange background color at low light intensities. At brighter light intensities, the colors start to become more natural again. A blue filter placed over the lamp absorbs the red parts of the spectrum and gives the picture a cooler, more neutral color. It is then not necessary anymore do correct the color temperature of the picture with the while balance tool of an image editing program. 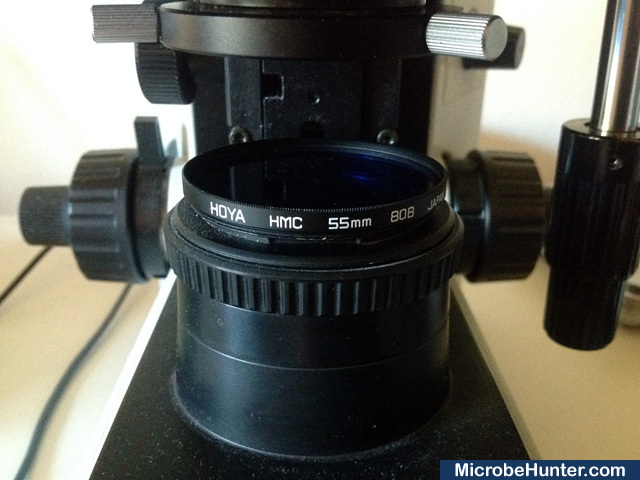 Some microscopes already come with swing-in blue filter under the condenser and it is not necessary to obtain a separate one. 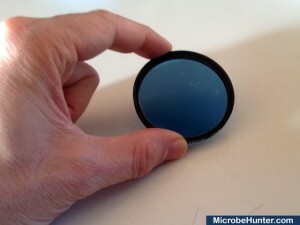 Many digital microscope cameras already have an integrated blue filter over the sensor of the camera as well. This is because camera sensors are very sensitive to red light. A blue daylight filter was used for analog photography. It made it possible to use daylight films in artificial light. The filter is placed over the microscope lamp.